Join us this Friday, December 4th, as the St. Dominic Savio Music program presents their annual Christmas Concert! 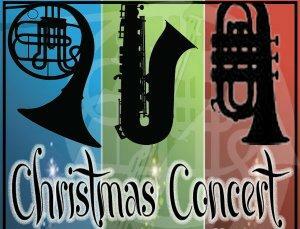 The concert will take place at 7:00 pm in the Savio Gym. Come enjoy your favorite Christmas songs and more! Ensembles performing include Percussion Ensemble, Wind Ensemble, Jazz Band, Chamber Choir, Concert Choir, Orchestra, and Symphony Orchestra. We hope to see everyone there for a fun night of music making! The Eagle Quiz Bowl team sent Patrick Lahey, Jack Frey, Nicholas Huth and Matthew Meskill to Brandeis High School in San Antonio for the Bronco Bowl on Saturday November 14th. Team captain Patrick Lahey was the only member of the team with significant experience at the varsity level, so when the team was placed in the upper division of the tournament the Eagles knew they likely were fighting long odds to go deep in the tournament. There were three teams from national power LASA, and, as luck would have it, the Eagles faced all three LASA teams in the preliminary rounds. In the first three rounds the Eagles faced LASA B, LASA C and Keystone High School. The Eagles suffered lopsided losses against the two LASA teams and came up just a bit short against Keystone by a score of 275-230. The 0-3 start had the Eagles feeling down, but their fortune changed in their fourth match against Flour Bluff A. In another hotly contested match the Eagles managed to hold off a late rally and prevailed by a score of 220-200. The Eagles led from wire to wire in their fifth match, blowing out Flour Bluff B 290-10. The Eagles then entered their final match of the preliminaries against the LASA D team. Earlier in the day LASA D was the subject of conversation as they had beaten the LASA B team in their preliminary round matchup. The early stages of the match went badly for the Eagles as they fell behind 65 to -5 after toss-up #3. By toss-up #6 the LASA lead had grown to 125-10, and at toss-up #8 the Eagles found themselves trailing 160-20. Matthew Meskill powered tossup #9, and the Eagles swept all 30 points on the bonus to make the score 160-65 before LASA grabbed the last toss-up of the first half to make it 180-65 at the midway point. Patrick Lahey got the Eagles on the board on a question about Cleopatra, but the Eagles missed all the bonus points. The LASA team uncharacteristically negged on toss-ups #13 and #15, and the Savio team took advantage. Jack Frey got toss-up #14 about zombies, Patrick got #15 about the Battle of Saratoga, and the team collected all the bonus points to close the gap to 170-155. LASA powered the next question about Tokyo but could only convert 10 of the 30 bonus points to leave the score at 195-155 after tossup #16. Neither team was able to get tossup #17 or #18. On toss-up #19 Patrick correctly identified Louisiana Governor Bobby Jindal and the team again swept all 30 bonus points to make the score 195-195 going to the final toss-up. Patrick came thru once again, correctly answering that Commodore Perry captained the USS Mississippi in an expedition that opened Japan to American trade. This toss-up sealed the victory for the Eagles and completed the biggest come-from-behind finish in recent memory. This was only the 3rd time in 24 matches that Savio has prevailed over a LASA team, and the first time at a varsity level event. The 3-3 preliminary round record was respectable, but unfortunately the Eagles bonus conversation average on the day was not good. After setting a new school record at the last tournament, the Savio team found itself as the lowest ranked of four 3-3 teams. This gave the Eagles the #8 seed for the playoff round. They faced the #9 team from Strake Jesuit. It was another gut-wrenching nail biter, and in the end the Eagles came up just short by the score of 280-270. This meant the Eagles finished the event in ninth place. Freshman Matthew Meskill was the leading scorer for the team with 37.86 points per game (7 powers and 4 NEG5's). The final tournament of 2015 will be the Houston Holiday Hoedown on December 12th at Seven Lakes High School in Katy. This is always a huge event and is expected to draw the best of the teams from Texas, which means that numerous teams with national rankings will be there. The Eagles plan to enter at least one team in the upper division of the tournament and would like to enter multiple teams in the lower division. In February the team will be sending a team to College Station to compete in a regional qualifier for the National Science Bowl. The team is looking for new players to round out the rosters for these events. Any Savio student interested should contact Coach John Isakson at jisakson@earthlink.net. Check out the season highlight video HERE! On Saturday November 14th, the Savio Academic team competed in the Belton Invitational meet. The Eagles took home first place honors in Team Number Sense, Team Math, Team Computer Science, and Team Calculator. They also took 2nd place in the overall sweepstakes, missing first place by a mere 10 points out of 180. Individual results are below. Our annual in-store Bookfair was a big success! 20% of the profits will be given to St. Dominic Savio, so thank you for supporting our school library. You can still participate through the online Book Fair until Thursday, November 19th. Enter Bookfair ID 11744919 at checkout. Thank you for your support for our Savio Library! Savio Football Sends Seniors Off With a Win! The St. Dominic Savio Eagles football team had an incentive to win, a very worthwhile incentive last Friday night as the Eagles bid farewell to their seniors with a resounding 37-20 victory over San Marcos Academy. On a perfectly cast fall evening in early November an emotionally charged Eagle football team was led to its fourth win of the season by nine determined seniors; Captains Marty Sedlacek, J.R. Flores, Simon Scales, George Miksch, and Logan Kuenstler, and Kayne Gonzalez, Michael Mole, Julian Sparks, and Bo Valko. Combined with the determination of the underclassmen, the Eagles offense exploded for over 450 yards of total offense, defensively held a potent SMA Bears offense in check for most of the night, and had stellar play on special teams. Coach Gutilla was extremely pleased for the team, and especially the seniors. "My smile had everything to do with the smile on the players' faces at the end of the game. I was thrilled for them. It has been a tough season, but these kids continually fought hard. Their persistence and determination paid off tonight. They dug deep and found a way to finish it off the way we (the coaches) knew they could." The Eagle offensive line opened huge holes in the Bear defense for senior RB George Miksch who finished the night with 182 yards rushing, and gave senior quarterback J.R. Flores the time to complete 5 of 8 passes including a 57 yard strike to sophomore wide receiver Mark Lacayo. Coach Gutilla commented, "The O Line played very well tonight. We focused on better execution of our plays all week at practice, and they got the job done tonight." "I'm very proud of this team, and especially the seniors." Eight Savio students competed in a speech and academic tournament at Holy Trinity Catholic High School in Temple on Saturday November 7th. This was the first competition for our speech team members. Julian Sparks, Rachel Givens, Andrea Poblete, and Caitlin McCauslin represented the Eagles in Solo Acting, Poetry Interpretation, Impromptu Speaking, and Prose Interpretation. Caitlin finished 4th in Solo Acting, and Rachel took 6th in Poetry Interpretation. The St. Dominic Savio Computer Science Team attended its 2nd tournament this weekend at the University of Texas at Dallas. The team competed against 73 other Novice teams, consisting of three members, each of whom had 1 or less years of computer science experience. The team had three hours to complete five novice problems and could then use its remaining time to attack five advanced problems. They had to use a University computer but could use any programming language they wanted. A big scoreboard showed up-to-the-minute results as teams electronically submitted solutions that were tested against random inputs. Each problem not only involved difficult coding, but required a complicated algorithm to make it work. As time went along, only Savio and one other team from Plano were able to complete the five novice problems and move on to the advanced problems. Savio finished three minutes faster, but were on the wrong end of the tiebreaker due to accumulated time penalties from incorrect submissions. With 30 minutes to go, each team had solved one of the advanced problems, and then the scoreboard went dark to prevent teams from knowing their place. Savio managed to get two more problems solved, but had no idea if it was good enough. The top three teams received individual trophies as well as a team trophy. Tensions were high as the 3rd place team was announced, but we knew we had won after Plano got their 2nd place award. Our team was called up to the front for pictures and the awarding of their 1st place trophies. Congratulations to our team, Matthew Bianchi, Emily Shoemaker, and Jonathan Shoemaker. The Savio Theater Department presents The Curious Savage, a comedy in three acts. Please join us in the Savio Gym on Thursday, November 19 and Friday, November 20 at 7:00 pm for this funny and heartwarming show. Admission is a canned food or dry pasta donation for Grace Ministries of Austin. Please come out to support Savio Fine Arts!